You always hear that chocolate can be very temperamental. 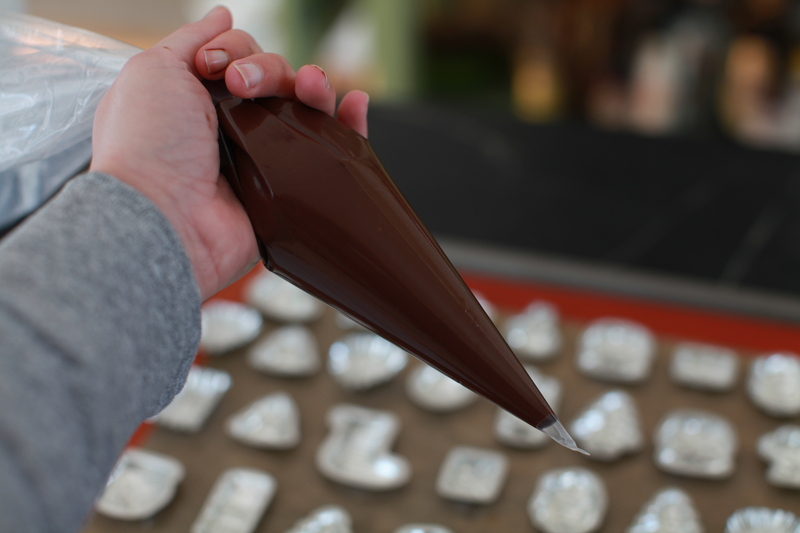 One of the reasons I’ve avoided doing much with chocolate up until now has to do with tempering. Tempering reorganizes the crystal structure in the chocolate to give it the stability to be formed into shapes and hold that form. It’s one of those things that has always seemed complicated and not worth the effort or potential failure of the finished product. I was also not willing to sink $300 into a good machine. Now I know I don’t have to. It’s not as hard as it might seem. Or I had beginner’s luck. I was working with semi-sweet dark chocolate. 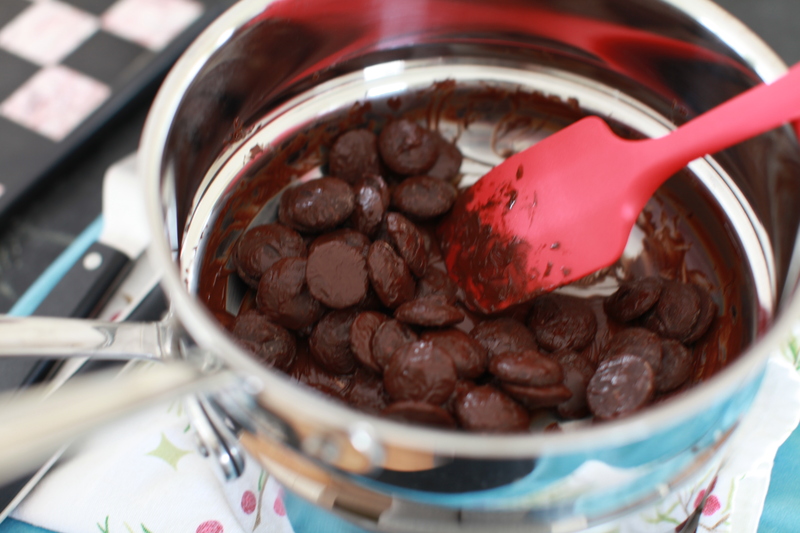 In a double boiler, I brought the water to 140 degrees and then turned down the heat and added the chocolate on top. You melt the chocolate and since it is dark, you want the chocolate at 120 degrees. I then transferred the chocolate to a heating pad with a towel on it on the counter. Once it is melted you take 2/3 and pour it onto a marble slab. I used my chessboard above since it’s the closest thing I have. I knew it would one day be useful when I lugged it back from a trip to Mexico! 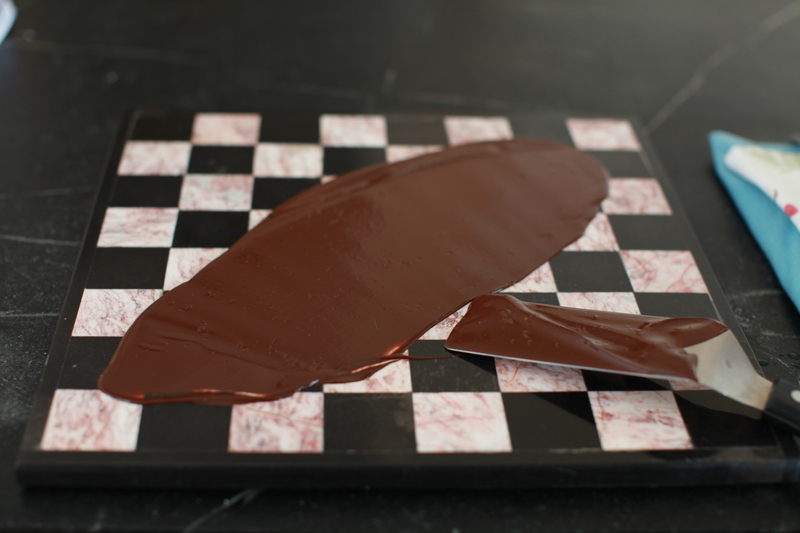 Using two metal spatulas you spread the chocolate out and then scrape and fold it back in until it seizes up a bit like a paste. Then you pour it back in with the other chocolate. You then want the temperature of the chocolate at 90 degrees (this varies with type of chocolate). You then do a test to see if the chocolate is tempered. 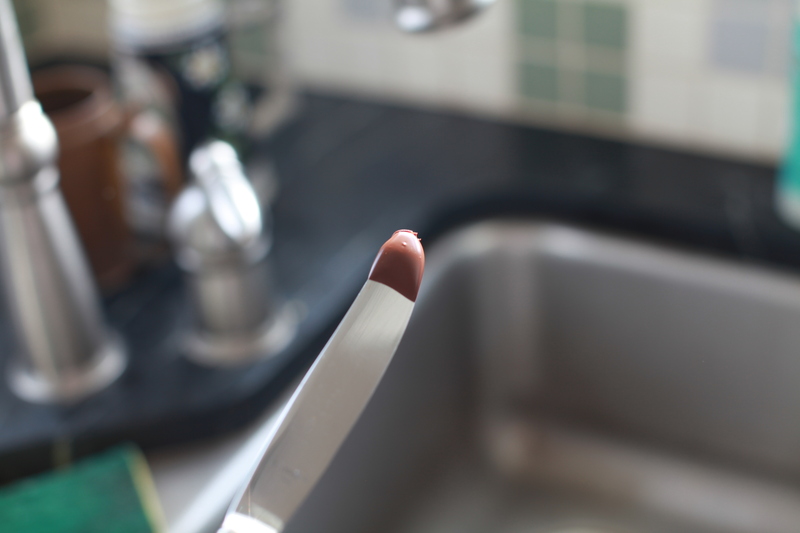 Using a knife you dip it in the chocolate and set it aside. I put mine in the refrigerator as it’s faster and then you don’t have to worry about your chocolate sitting around for 5 minutes. It came out smooth and slightly glossy which means it was tempered correctly. 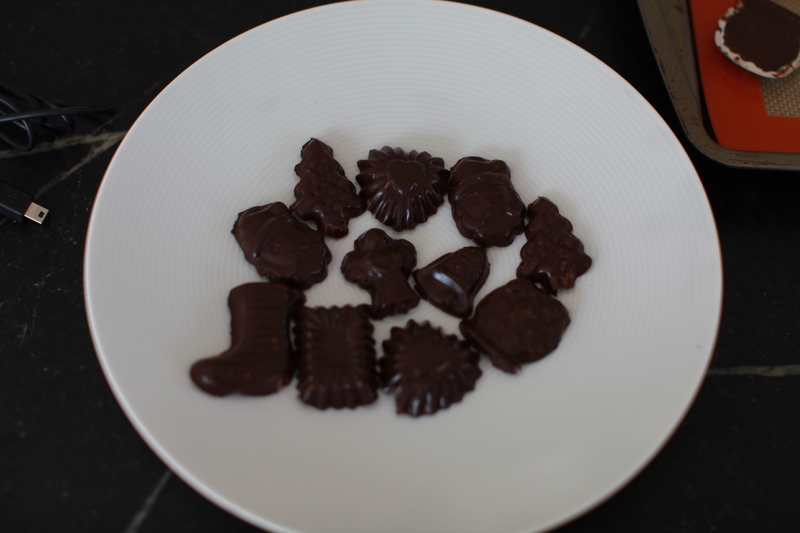 I then transferred the chocolate to a pastry bag to pipe into some little holiday moulds I bought. DO NOT BUY CHEAP MOULDS. These, while cute were a huge pain to deal with and didn’t pop out well on the back end. I would avoid metal completely and only work with plastic or silicone in the future. Since I was just playing around with tempering it wasn’t too big a deal. As you can see these turned out nice and shiny, so the experiment worked. Now I have a week of chocolate making behind me, I’m ready to tackle some more advanced stuff. I definitely want to try to learn to make my favorite chocolates of all, chocolate covered salted caramels. I just have to learn how to make caramel first which is even more temperamental than chocolate. You are currently reading To Temper or Not to Temper at 52 To Do.